Since my last fix was a dud, Stitch Fix offered to send me another fix with the styling fee waived. I couldn't say no to free shopping from my home, so I scheduled it to arrive over spring break. 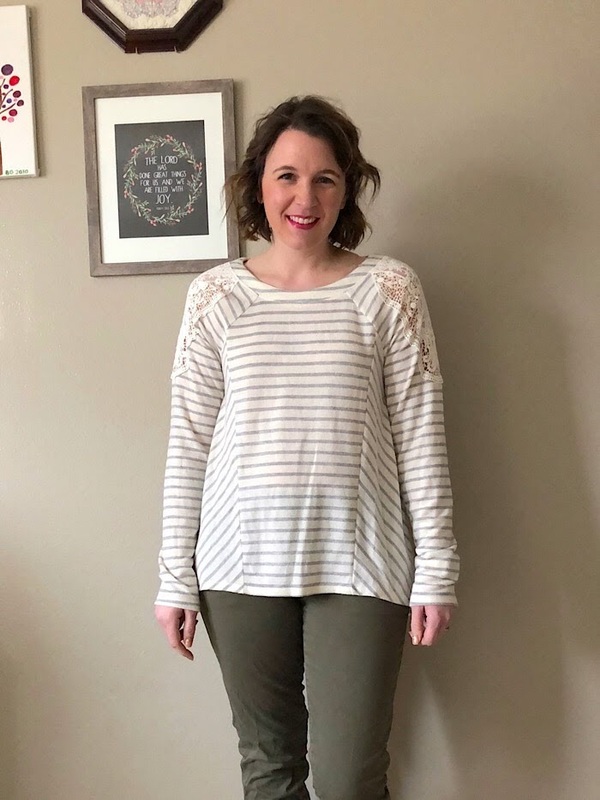 If you aren't familiar with Stitch Fix, you pay a $20 styling fee, then a stylist selects items based on your style profile and any notes you leave with requests for things you'd like. I liked a couple things about this top. First, it fit well. 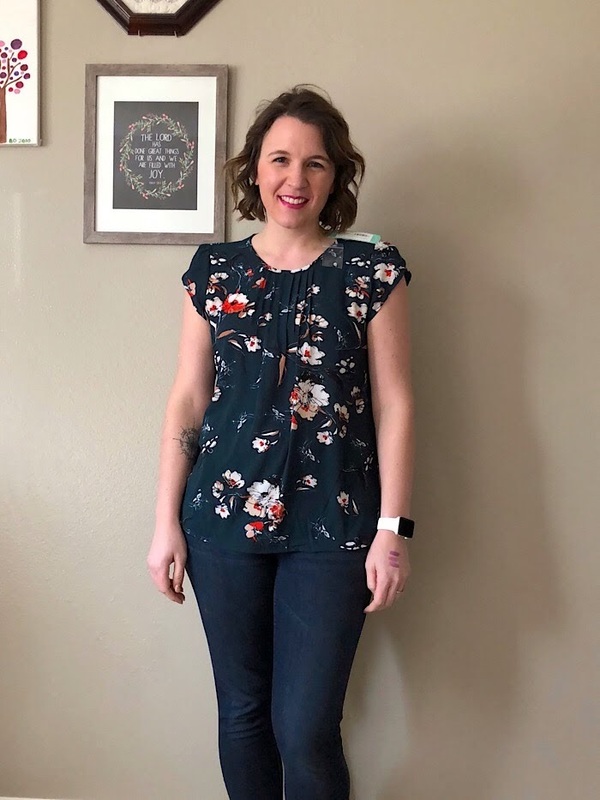 Second, the price was very affordable for Stitch Fix. But, I didn't love dark color of it and the fabric was a little scratchy, so I decided to return it. 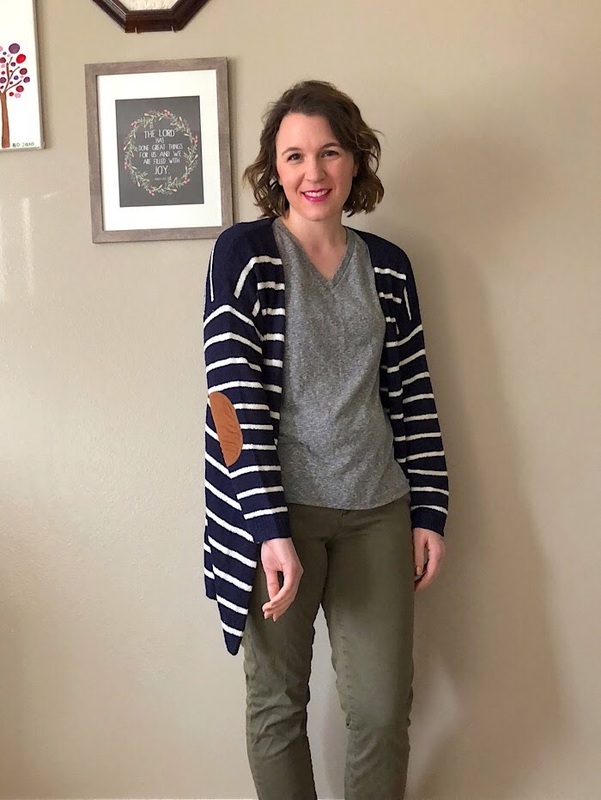 I'm a total sucker for elbow patches and stripes. Looking at this online, I totally thought it would be a keeper, but there were just a few flaws with it. It felt really boxy and I wasn't a fan of the sweater knit itself. It felt kind of scratchy. So, unfortunately it went back! I really liked the fabric of this chambray top. It was SO soft, but I wasn't a fan of the star print. I felt like anytime I would wear it, it would seem like the fourth of July. Had the print been polka dots I mat have considered keeping it, but it went back. This top was pretty cute, and I loved the lace detail on the top. It also fit really well and was soft. Now reflecting on it, I'm not sure why, but I sent this one back! But, I did. This top was the one I was most excited about getting when I peeked at my fix. I put it on and it was so soft. I loved the lace detail. 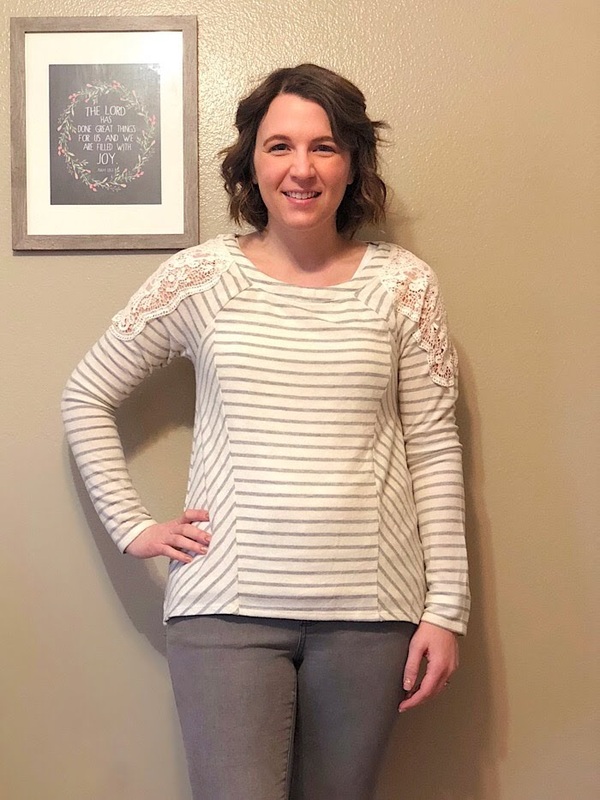 I don't have many nice long sleeved tops that aren't cardigans, so I was looking for something I could wear without having to layer up. The downside of this top is that it was a little big. When I first went in, there were none available in the next smaller size, but I checked back a few days later and there was, so I decided to exchange it. I'm really please with the new smaller size. I checked out with my Fix on Tuesday and got the exchange in the mail on Saturday. 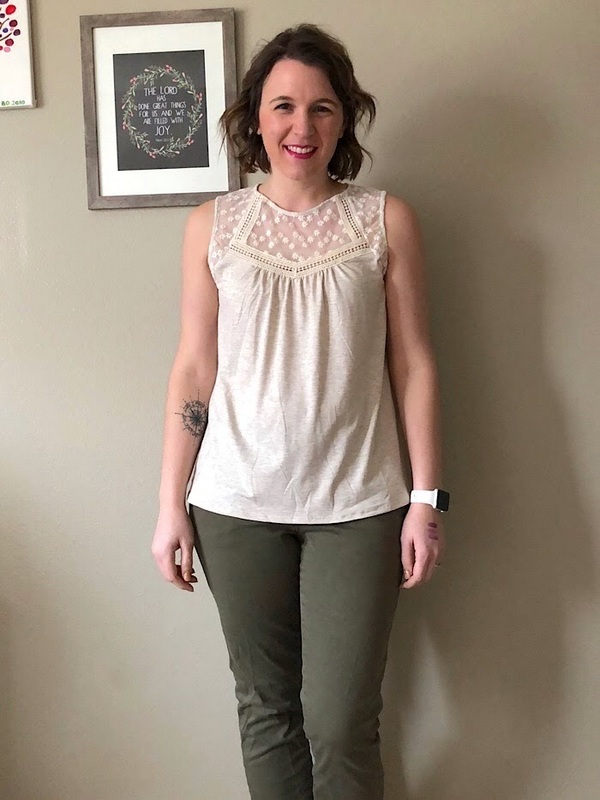 I think this will be a great top for spring, don't you? 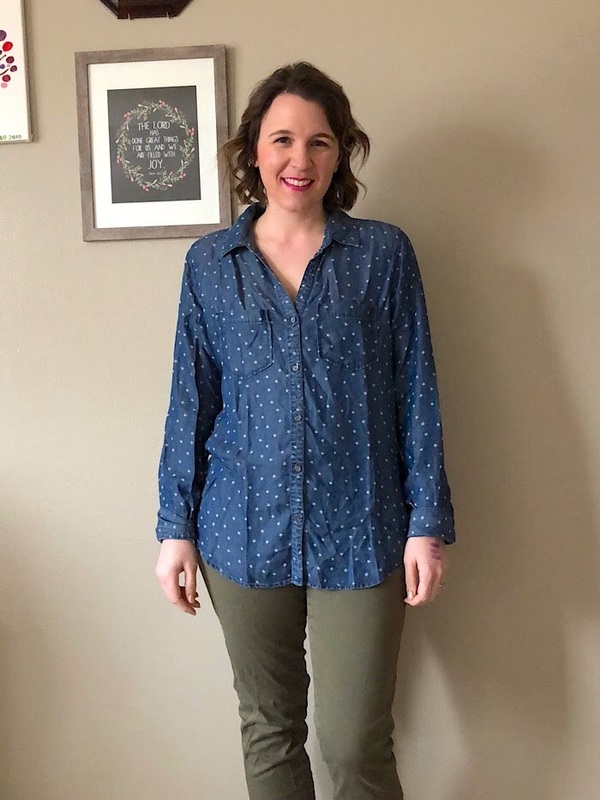 If you want to try Stitch Fix for free, use this link to get your first styling fee waived!